Filed under art on October 19, 2014. 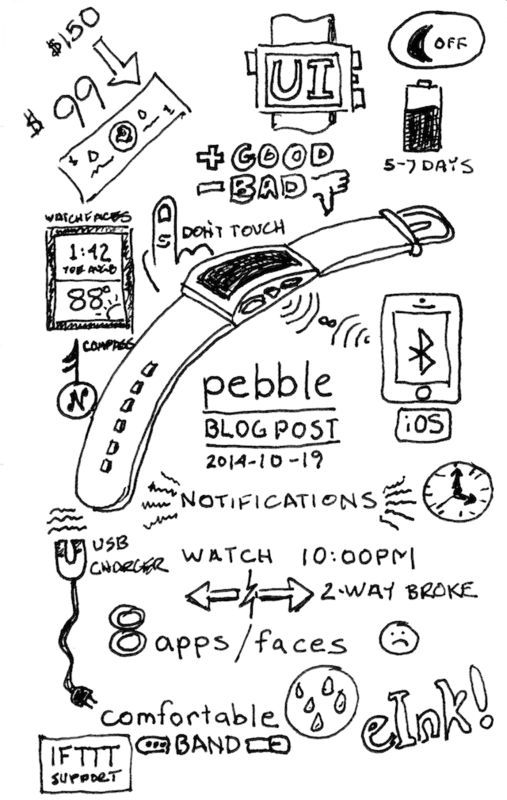 Description: Before creating my blog post on the Pebble watch recently purchased, I decided to perform a quick sketchnotes brainstorming session. I broke out a small pocket notebook I found on clearance at Barnes & Noble and my trusty Pilot pen. I use this notebook to capture ideas while I read and this was the first time I used a single page to capture several thoughts I wanted to make in my blog post. This sketchnote became a kind of pictorial mind map. While there is no structure to my doodles, I did use the sketchnote to ensure I captured all the key points.